On February 27, 2011, the musical compositions Aan de zon de wereld (2006), Bridge of Babel (2009), Curved space/Gekromde ruimte (2009) and Poetry Pieces I-III (2008) by Rozalie Hirs are performed at De Toonzaal in ‘s-Hertogenbosch, The Netherlands. The photo, with Stevko Busch, Arnold Dooyeweerd and Rozalie Hirs, was made by Keiko Shichijo. 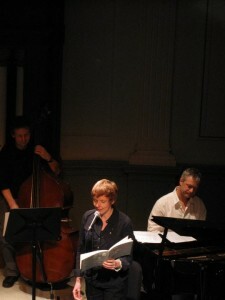 Performers: Ned McGowan (flute), Tobias Klein (contrabass clarinet), Joost Buis (trombone, lapsteel guitar), Stevko Busch (piano), Robert van Heumen (computer, controllers), Arnold Dooyeweerd (double bass), Rozalie Hirs (voice). With financial support from the Prins Bernhard Cultuurfonds/Alida Beekhuis Fonds. From the 14th to the 19th of February of 2011, Rozalie Hirs is guest of the International Poetry Festival in Granada, Nicaragua. Seventy poets hailing from some thirty countries are attending the festival. All poets read at 4 or 5 events in and near Granada. 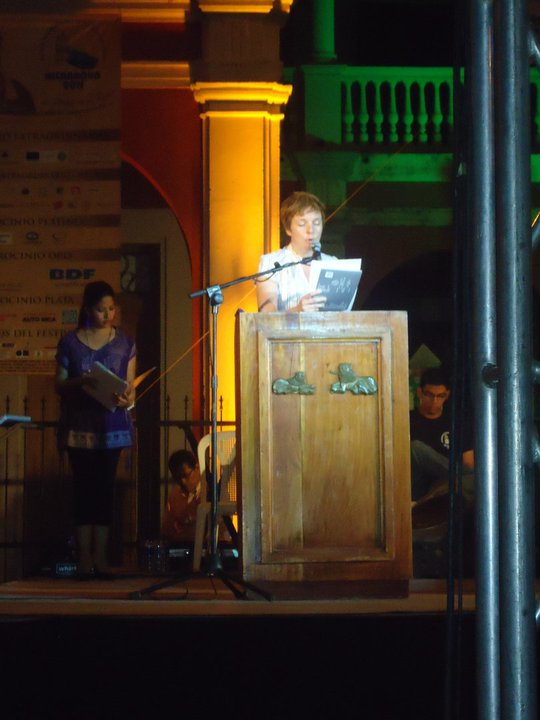 The photo was made on February 17, 2011, at Plaza de la Independencia, Granada, Nicaragua, during which event Rozalie was reading the poems ‘Stamboom’ (‘Árbol genealógico’) and ‘Tuimelaar’ (‘Delfín mular’). The Spanish translations were made by Diego Puls.